Nostradamus recalls the glory of Carthage. 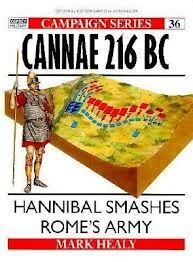 + The Roman historian Livy mentions that Hannibal's father forced his son to promise eternal hatred against the Romans. 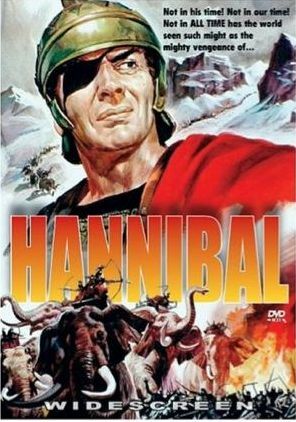 + Hannibal was a Punic Carthaginian military commander, generally considered one of the greatest military commanders in history. His father, Hamilcar Barca, was the leading Carthaginian commander and statesman (leader of the Barcid family) during the First Punic War. He may have been responsible for creating the strategy which his son Hannibal implemented in the Second Punic War to bring the Roman Republic close to defeat. + One of his most famous achievements was at the outbreak of the Second Punic War, when he marched an army, which included war elephants, from Iberia over the Pyrenees and the Alps into northern Italy. + In his first few years in Italy, he won three dramatic victories—Trebia, Trasimene, and Cannae, in which he distinguished himself for his ability to determine his and his opponent's strengths and weaknesses, and to play the battle to his strengths and the enemy's weaknesses—and won over many allies of Rome. Qu'avint viendra par Babel(1) aux Romains. In the past than will come to the Romans through Babel(1). 1- BABEL: Modern day, Tower of Babel ruins is on the outskirts of ancient Babylon (current day Iraq). 2 - FROM ORIENT TO ISRAEL, SPAIN & FRANCE. 1 Rivers: Muslim troops reach these rivers of Israel, French and Spain. 2 Mules or Asses: Symbol of the U.S. Democratic Party. Now run the country and be defeated militarily. 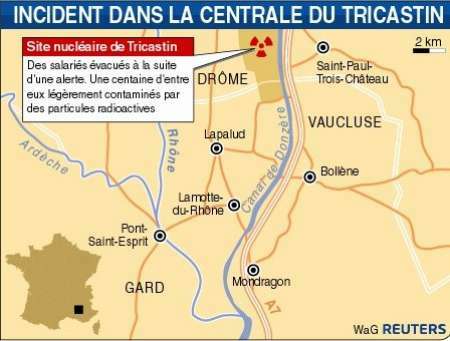 Who made this map forgot the Rhone river, the river most mentioned by Nostradamus. 1- CAMEL: Camels have been used militarily, especially, for his ability to frighten horses, a quality famously used by Achaemenid Persians when fighting against Lydia. Moreover, the Persians used to use camels as trains to transport supplies weapons and equipment. Horses hate the smell of camels that are nearby, even becoming difficult to control. The rivers are the front lines and Muslim troops suffer a decisive defeat near the Alps. 3 - HANNIBAL KEEPS HIS PROMISE. Hannibal's father forced his son to promise eternal hatred against the Romans. to trouble Hadrie(1) and the heirs of Romulus(2). the temples of Malta and nearby islands to be deserted. + Option A: Adria is a town and comune in the province of Rovigo in the Veneto region of Northern Italy, situated between the mouths of the rivers Adige and Po. + Option B:Atri (Greek: Ἀδρία or Ἀτρία; Latin: Adria, Atria, Hadria, or Hatria) is a comune in the Province of Teramo in the Abruzzo region of Italy. It has a population of over 11,500 (2001). Atri is the setting of the story The Bell of Atri. 2 Romulus: Romulus and Remus are the twin brothers and central characters of Rome's foundation myth. (3) After Libra will leave her Phaethon. 1 -Urn: Perhaps "Democracy" or "People" but the interpretation depends on the use of the urn. Is a funeral urn? + Is the symbol of death? because one of the things Deucalion did was to repopulate the earth. 2 -Deucalion:In Greek mythology, Deucalion (Ancient Greek: Δευκαλίων) was a son of Prometheus; ancient sources name his mother as Clymene, Hesione, or Pronoia. + Son of Prometheus who reigned in the regions near Phthia. + Phthia (Φθίη ancient Greek, ancient Phthíê, modern Fthíi) is an ancient region of Greece, in the south of Magnesia, on both sides of Mount Othrys. It was the home of the tribe of the Myrmidons, who participated in the Trojan War commanded by Achilles. + The anger of Zeus was ignited by the hubris of the Pelasgians, and he decided to put an end to the Bronze Age. Lycaon, the king of Arcadia, had sacrificed a boy to Zeus, who was appalled by this savage offering. Zeus loosed a deluge, so that the rivers ran in torrents and the sea flooded the coastal plain, engulfed the foothills with spray, and washed everything clean. + Deucalion, with the aid of his father Prometheus, was saved from this deluge by building a chest (literally “chest” like the Bible's “ark,” which means “box”) Like his Biblical equivalent Noah and Mesopotamian counterpart Utnapishtim, he uses his chest to survive the deluge with his wife, Pyrrha. 3: I do not know yet but the story of Phaeton is very sad: He drives the chariot of the sun and does great harm to the land, and eventually dies. 5 - FRENCH FLEET DEFEATED, ISLANDS CAPTURED. 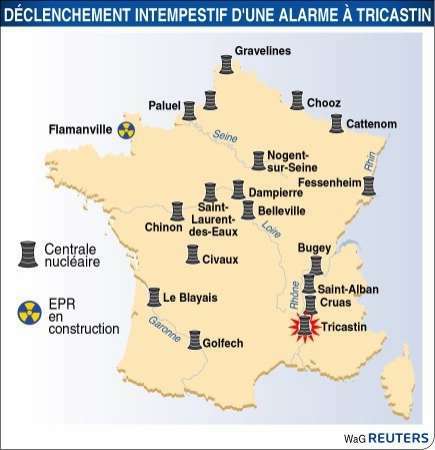 1 Tricast: Perhaps Tricastin (Provenca, France) and Nuclear site. +The Tricastin is an area around Saint-Paul-Trois-Châteaux in Provence, France. The name derives from the Gaulish tribe Tricastini, which was part of the confederation of the Cavares. The capital of the region, Saint-Paul was named Noviomagus before becoming Augusta Tricastinorum under Augustus's reign, and later Colonia Flavia Tricastinorum. During Middle Ages, a confusion between Tricastini and Tria Castra (Three Castles) is responsible for the modern name of Trois Châteaux. Nuclear threat and Avignon will be the capital of France. Addenda et corrigenda Nov. 24, 2012. Barbarian expelled until way back as far as Tunisia (1). + Ancient Carthage was a Semitic civilization centered on the Phoenician city-state of Carthage, located in North Africa on the Gulf of Tunis, outside what is now Tunis, Tunisia. 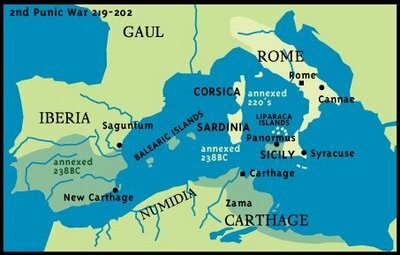 + For much of its history, Carthage was in a constant state of struggle with the Greeks on Sicily and the Roman Republic, which led to a series of armed conflicts known as the Greek-Punic Wars and Punic Wars. They also had to deal with the volatile Berbers, the indigenous inhabitants of the entire area where Carthage was built. 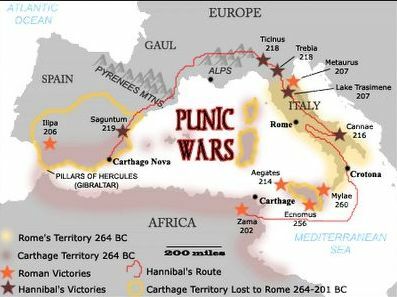 + Hannibal's invasion of Italy in the Second Punic War culminated in the Carthaginian victory at Cannae and led to a serious threat to the continuation of Roman rule over Italy; however, Carthage emerged from the conflict weaker after Hannibal's defeat at the Battle of Zama in 202 BC. Following the Third Punic War, the city was destroyed by the Romans in 146 BC. However, the Romans refounded Carthage, which became the Empire's fourth most important city and the capital of the short-lived Vandal kingdom. It remained one of the most important Roman cities until the Muslim conquest when it was destroyed a second time in 698. Hannibal came to France via Spain. 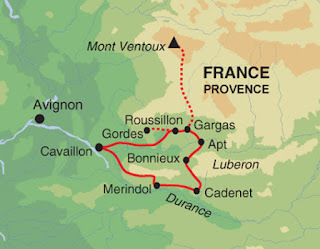 + It appears that he will be able to break five defenses (or walls) along the Rhone River and so it came to Avignon. Last Battle near Avignon. See Luberon & Durance river. Le roy de Bloys dans Avignon regner. The king of Blois to reign in Avignon. Jusques a cinq le dernier pres de Nole (o Nolle, Nolie ....). Five till the last one near Nole ( or Nolle, Nolie ....) . 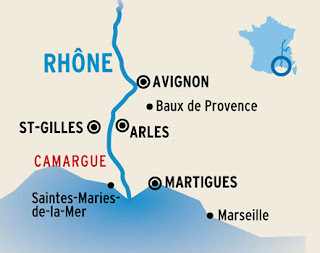 + But Avignon will be the capital of France because there is no other choice? + What horrible things can happen in the rest of France? In the early Spring of 217, Hannibal left his winter quarter at Bologna, traversed the Apennines and ravaged Etruria (modern Tuscany). During a minor engagement, he lost an eye (although some historians claim that he suffered from opthalmia). + If you remember the story of Anibal you can easily understand what Nostradamus is explained using the history of the Roman Empire. It is Obvious. + It's another way of telling the Muslim invasion of Europe. Soon I'll include nostradamus texts in which these words appear: vendredy, venus, Jeudy, Jupiter, Saturn ...... related to the Muslim world. Maybe I can to learn English. I just applied the Set Theory to the work of Nostradamus. And also use a map to place each thing in a certain place and so I get a story that is ordered like a narrative. There are more quatrains about Tunisia that I have not included, it is possible a sequel or addition. Good Bye and Merry Christmas 2012. Tell me why are we, so blind to see.